The humanitarian hub in northeastern Nigeria will facilitate access for aid agencies. Nigeria – The humanitarian community will soon be able to better coordinate support for northeast Nigeria, where nearly seven million people are in need of life-saving assistance. This is thanks to the setting up of a humanitarian base camp and hub project, which will cover Borno, the state hardest hit by the Boko Haram conflict. Connecting different aid agencies through a base camp and hubs will allow humanitarian actors to communicate, plan and deliver aid more efficiently and effectively. The base camp, to be located in Maiduguri, will provide tented accommodation for 100 humanitarian workers from the UN and NGOs and other basic amenities to ensure a productive living and working environment. It will also include offices and workspaces, thanks to support in planning, design and delivery from the International Humanitarian Partnership (IHP) and its implementing partner, the Swedish Civil Contingencies Agency (MSB), and the wider humanitarian community. Eight smaller hubs around the northeast will allow humanitarian workers to reach millions quicker, with life-saving services, such as food distribution, medical and mental health support and shelter provision amongst others. IHP’s team and partners, MSB, will oversee the construction of the base camp and hubs. IOM is managing the project on behalf of the large humanitarian community that the hubs will serve. “I am convinced the base camp and hubs will allow the prolonged humanitarian presence and interventions necessary to save and improve the lives of hundreds of thousands of Nigerians affected by the conflict,” said Emma Khakula, head of IOM Nigeria’s Maiduguri sub-office. Insecurity has previously made many areas completely inaccessible to humanitarian agencies or accessible only for rapid aid delivery, usually done by helicopter, further restricting access. The hubs will allow humanitarian workers to stay in secure and well-established locations for longer periods and better connect with local communities to meet their needs. The initial eight hubs (at least 12 are expected) will be located in: Gwoza, Bama, Dikwa, Banki, Biu, Monguno, Damboa and Gambara Ngala in Borno State. These have become accessible in recent months due to improving security. Like the base camp, the hubs will include accommodation, offices, and warehouses to store supplies, like food and household items for distribution to some of the more than 1.8 million internally displaced Nigerians in the region. Existing hubs will be moved and others will be built based on need, as conditions improve or change. 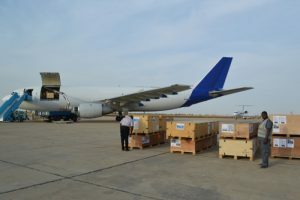 “The hubs will provide secure environments for humanitarian workers to deliver aid more widely, facilitate sector and inter-agency coordination, and create possibilities for community engagement and participation,” explained Sweden’s ambassador to Nigeria, Inger Ultvedt, who helped receive the delivery of building materials, which arrived in Maiduguri from Sweden on 4 December. Timing is critical; in addition to the millions already requiring urgent humanitarian interventions, UN agencies predict that more than five million people will be in desperate need of food in 2017. IHP and its partner, MSB, are providing USD 5.5 million towards the project. The total cost to operate and staff the base camps and hubs over the next year is estimated at USD 14 million. The Humanitarian Response Plan, prepared across agencies, seeks more than USD 1 billion to meet such needs of millions in Nigeria over the coming year.